Last year, the 1,000 enterprises covered by CommonWealth Magazine’s 2016 Greater China Top 1,000 Survey racked up combined revenue worth NT$234.7 trillion and profits totaling NT$18.6 trillion, representing year-on-year growth rates of 3.5 percent and 0.9 percent, respectively. Business in 2015 was at its slowest since the financial crisis of 2007-08. These figures are not surprising. Taiwan’s GDP grew only by 0.85 percent last year, the worst performance in six years. The Chinese economy grew 6.9 percent in 2015, its lowest growth rate in 25 years. Crude oil prices plummeted in 2015, with devastating consequences for related industries. The profits of China’s three leading oil and natural gas companies - PetroChina Company Limited, CNOOC Ltd. and China Petroleum and Chemical Corporation – which had registered combined profits in excess of NT$1 trillion in 2014, saw their profits halved in 2015 for a total of NT$438.36 billion, down 58.2 percent year-on-year. Another mega size central energy enterprise, China Shenhua Energy Company Limited, saw its profits shrink 57 percent due to the collapse of coal prices. The big drop in commodity prices even drove Glencore plc., a Hong Kong-listed multinational commodity trading and mining company, to the brink of collapse due to spiraling losses totaling NT$160.81 billion. In stark contrast to the ailing energy and raw materials sectors, the securities industry thrived. Although the Chinese stock markets were highly volatile in 2015, with the Shanghai Stock Exchange Composite Index skyrocketing 60 percent in the first half of the year and virtually erasing all gains in the following two months, the securities firms did well overall because “we had already made enough money in the first half,” Liu Fang-rong, a securities CEO, says. 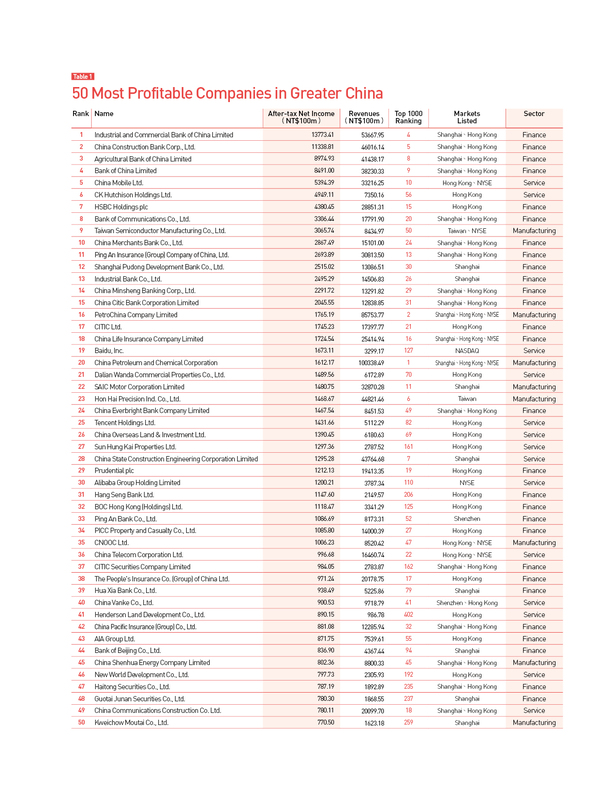 Against this backdrop, three state-owned Chinese securities firms - China Citic Bank Corporation Limited, Haitong Securities Co., Ltd. and Guotai Junan Securities Co., Ltd. – made it into the ranks of the 50 Most Profitable Companies. 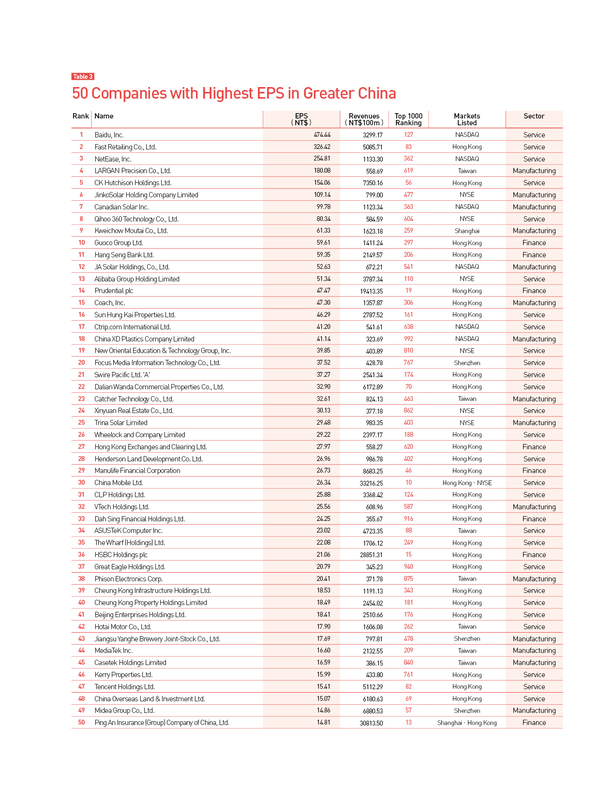 It deserves to be mentioned that the Taiwan Semiconductor Manufacturing Company (TSMC) for the first time made it into the top 10 of most profitable companies in Greater China. Thanks to Apple orders for the A9 processor, TSMC registered massive revenue growth, posting staggering profits of NT$306.57 billion, which is roughly the equivalent of the total government budget of the Republic of China for two months. TSMC has proven that Taiwan’s semiconductor industry can be as profitable as China’s monopoly-like state-owned enterprises as well as its real estate and finance sectors thanks to its cutting edge, globally leading manufacturing technology. “That’s something to be truly proud about,” notes Liu, who is a longtime Shanghai resident. Yet TSMC’s outstanding performance cannot hide the fact that the overall influence of Taiwanese companies in the Greater China economies continues to wane. Our latest survey shows that the number of Taiwanese enterprises among the top 1000 companies of Greater China continues to decline, a trend that had already begun a few years ago. 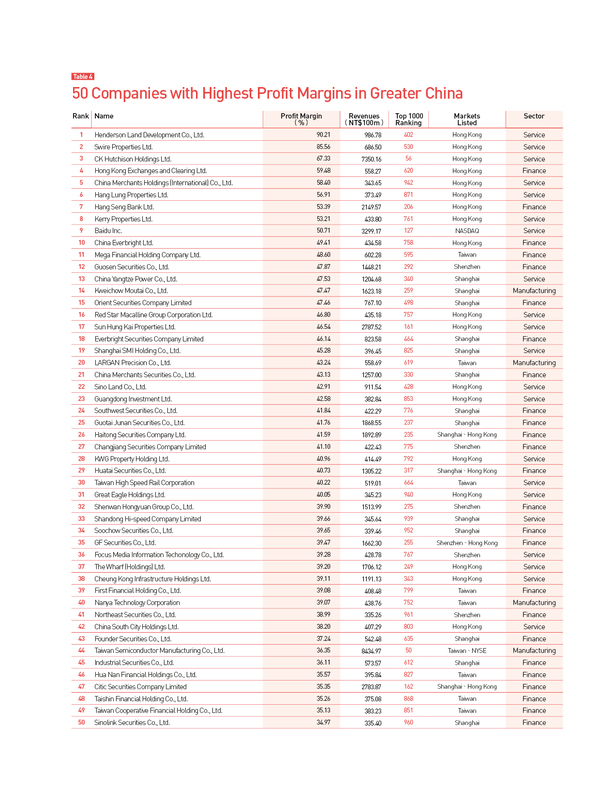 While 151 Taiwanese enterprises were in the top 1,000 in the past, that number has dropped to 136 this time. Even more shocking is that the Taiwanese enterprises that still remain among the top 1,000 used to be highly successful in tapping into China’s domestic demand. But now their business is stagnating or even shrinking and losing money. Two Taiwan-invested food giants, instant noodle maker Master Kong Holdings, and rice cracker maker Want Want China Holding Limited, saw their revenue slip 11.1 percent and 9.2 percent, respectively. Taiwan-controlled Daphne International Holdings, one of the largest women’s shoes retailers in China, not only experienced a 19.1 percent drop in revenue last year, but also suffered its first losses in a decade. “This is due to the fact that Chinese demand is becoming more upscale,” observes Jordan Chen, chief investment officer with the Taiwan branch of the British asset management firm Schroders. This new aspiration for an “upscale” lifestyle is fueled by several interlinked factors: Soaring Chinese salaries; the return of large numbers of Chinese studying abroad, and the generation born after the 1990s becoming the driving force in domestic consumption. Most importantly, information and products can be circulated at a faster pace thanks to the Internet. As a result, Chinese consumers have begun to develop more sophisticated tastes, going for high-quality, healthy and personalized products. Two years ago, the Uni-President Group heavily invested to grab market share for its Lao Tan Pickled Cabbage and Beef Flavored Noodles against its main rival Master Kong. To boost sales and attract price-conscious customers, the company threw in a free ham sausage for each instant noodle pack purchased, forfeiting profits. However, Uni-President soon cut losses from the sausage freebies by launching several innovative new products that appealed to the health-conscious and individualistic consumer such as Classmate Xiaoming cold brewed tea drink and Haizhiyan juice drinks. Uni-President China Holdings Ltd. therefore became the best-performing domestic demand-oriented Taiwanese company in China. While revenue contracted slightly, profits grew 192.4 percent, posting a new record of NT$4.15 billion. “The wind has changed direction. Those who catch up with the trend will be the winners,” says Chen of Schroders Taiwan. The beer market saw a similar development toward a more discerning taste, away from quantity to quality. The revenue of China’s three leading breweries - Tsingtao Brewery Co. Ltd. (Tsingtao Beer), Beijing Yanjing Beer Co. Ltd. (Yanjing Beer) and China Resources Beer (Holdings) Co. Ltd. (CR Beer) –contracted between 5 percent and 21 percent last year. Chen believes this decline can be attributed to changing consumer tastes since craft beers from local micro breweries have lately become a craze in bars, pubs and restaurants in Beijing, Shanghai, Guangdong, Shenzhen and other metropolitan areas. Great Leap Brewing, for instance, which runs three brewpubs in the Chinese capital, offers a wide range of specialty beers made with traditional local ingredients and flavors including banana wheat, cinnamon rock ale and honey ma gold. A bottle of these craft beers can set you back more than 100 renminbi (about US$15). In the sports shoe industry, established homegrown brands such as Li-ning and Xtep have seen their once brisk business turn sluggish as image-conscious Chinese consumers defect to international brands such as Nike and Adidas. This shift toward international brands has mainly benefitted Pou Sheng International (Holdings) Ltd., the main licensee for the Nike and Adidas brands in China and a subsidiary of Taiwanese sportswear retailer Pou Chen Corp.
Pou Sheng International's revenue grew 16.1 percent to NT$74.51 billion last year, enabling the company to turn loss into profit; after tax net income reached NT$2.09 billion. Growth momentum was sustained into the first quarter of this year with profits soaring 156 percent. Consequently, the share price of the Hong Kong-listed company has more than tripled over the past 18 months. Buoyed by consumer trends, the loss-making millstone has turned into a cash cow for the Pou Chen Group. However, the question is how long Pou Sheng International’s boom will last. Sooner or later, the tempestuous e-commerce revolution that has already hit China’s brick-and-mortar retailers will likely also engulf the sportswear industry. Taiwan-invested RT-Mart China, the pioneer of China’s retail industry, has already been swept into the center of the Internet storm. 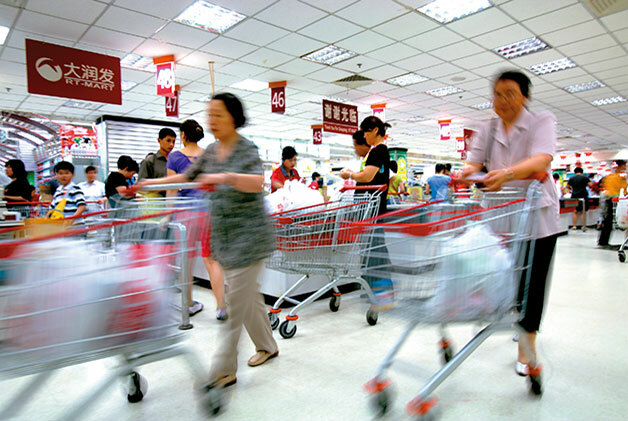 Competition from the many online shopping portals such as Tmall.com, jd.com or yhd.com put the brakes on revenue growth at the Sun Art Retail Group, the parent company of RT-Mart China. The company reported profits worth NT$12.24 billion last year, a 15.7 percent decline year-on-year. It was the first time that profits shrank since the company, China’s largest hypermart operator, was publicly listed on the Hong Kong stock exchange in July of 2011 in what industry insiders regard as a warning sign. Peter Huang, CEO of RT-Mart China, presently spends most of his time on the company’s retail website feiniu.com. He aims to make the shopping portal the number three alongside industry giants Alibaba and Tencent. Achieving this goal won’t be easy. Baidu, Alibaba and Tencent, known in China as “BAT,” dominate the Internet service portal market. This year, the trio joined the ranks of the 50 most profitable enterprises together for the first time, and reported combined profits of more than NT$430 billion, only slightly less than the combined profits of TSMC and Hon Hai. In terms of size of profits, traditional retailers like RT-Mart lag far behind the Internet giants. Moreover, e-commerce, which has penetrated virtually every trade and industry, keeps changing the structure of the real economy. Because of his work, Chen often makes business trips to the Schroders Shanghai office in the Shanghai World Financial Center. During his leisure time, Chen likes to tour the nearby Super Brand Mall and other popular shopping venues to observe the market situation. The outlook for the retail business is getting visibly bleaker. “I feel that the department stores are becoming marginalized,” Chen says. Lately, “private consumption paid with government funds” has markedly decreased due to Chinese President Xi Jinping’s crackdown on corruption. The other reason for sluggish department store sales is the substitution effects from the shift to e-commerce. Joseph Tsai, the Taiwan-born Alibaba vice chairman, said in an interview with CommonWealth Magazine last year that the ratio of brick-and-mortar retail stores in large shopping malls will decline in the future while experience economy businesses such as restaurants and cinemas will become the main force. 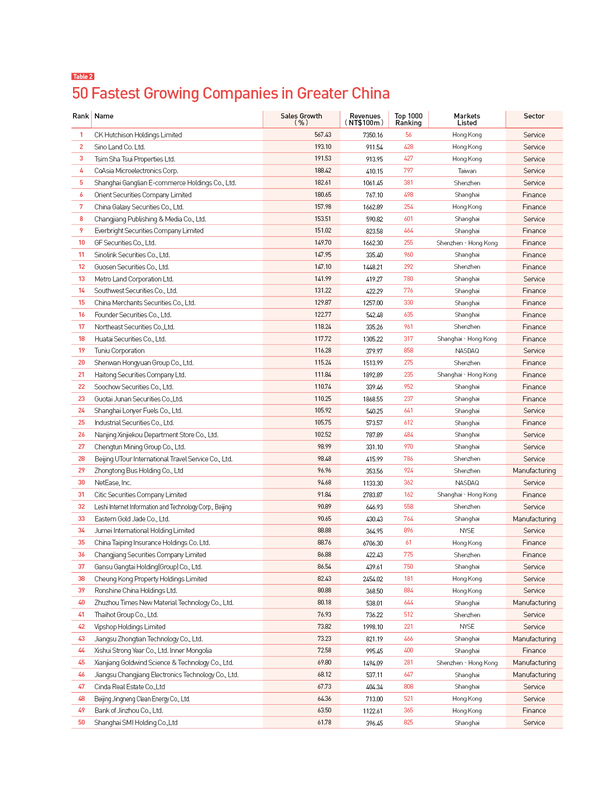 This year, there is a newcomer among the 50 fastest-growing companies, one whose performance leaves Taiwan’s semiconductor companies simmering with jealousy. Jiangsu Changjiang Electronics Technology Co. Ltd. (JCET) grabbed rank 46 with a revenue growth rate of 68.1 percent. A typical state-owned enterprise, JCET last year acquired Singapore-based STATS ChipPAC Ltd., the world’s fourth largest provider of chip packaging and test services, securing a market position that constitutes a threat to the advanced technology and output of Taiwan's Advanced Semiconductor Engineering Inc. (ASE) and Siliconware Precision Industries Co. Ltd. JCET has become the new enemy of Taiwan’s semiconductor packaging industry. Industry insiders point out that JCET recently already won orders for assembling Apple system-in-package modules, which will negatively affect the results of ASE and its subsidiary Universal Scientific Industrial (Shanghai) Co. Ltd.
Beijing’s “Made in China 2025” initiative fully supports the homegrown semiconductor industry. Therefore, we can expect companies that belong to the red supply chain to become a new force in future Greater China Top 1000 surveys.